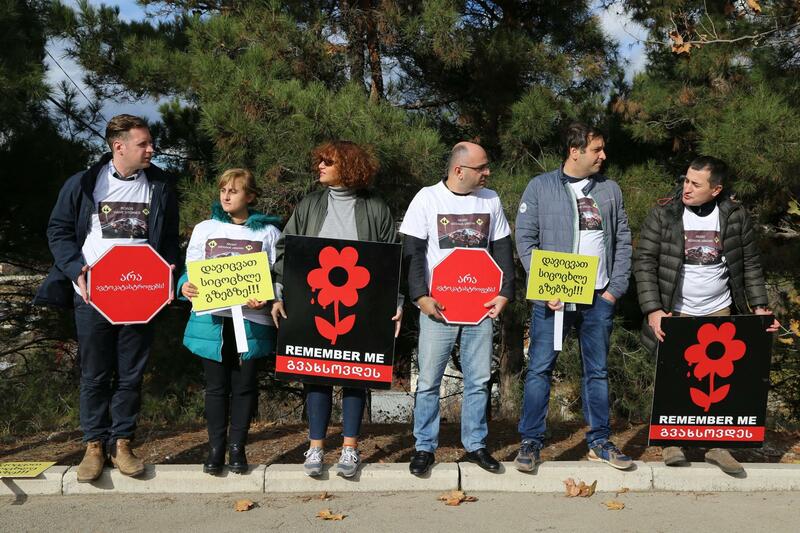 With regards to the World Day of Remembrance for Road Traffic Victims , the Georgia Alliance for Safe Roads along with partner organizations held a street action on November 18, on one of the black sections at Khudadovi Street in Tbilisi, where so-called ‘illegal races’ often take place. The Roads Have Stories – telling the stories, some of which are being tragically ended – was the main message of the day. Improvement of security on roads will scale down the number of tragic stories. The purpose of the event carried the importance of reminding the public and the authority that the road accidents can be avoidable and the following measures are required – safe infrastructure, safe transport, raising awareness among road users. Highlighted road section is a high risk zone for road users as the vehicles develop high speed, consequently, preventive measures are required in order to ensure secure infrastructure. Citizens residing nearby Khudadovi street and civil sector representatives participated in the event. Racers and the citizens discussed safe movement on roads and risks arising. As a tribute to the road accident victims, the trees have been planted in their names to the accident scene. The World Day of Remembrance for Road Traffic Victims is commemorated by World Health Organization (WHO) and United Nations (UN) since 2005 worldwide.